Built in the 1860s, the Collinwood House is thought to be the oldest house in Plano. The house was built by brothers J.K. and C.M. Fox and is an excellent example of a rural farmstead in an area that has been surrounded by suburban development. As such, its preservation in the midst of a densely developed area is important in that the rural setting and context of the structure can be maintained and enjoyed in a park-like setting. Removal of the house from its original site would rob the house of its integrity, and almost certainly result in a loss of potential National Register status and its qualification for tax credits. 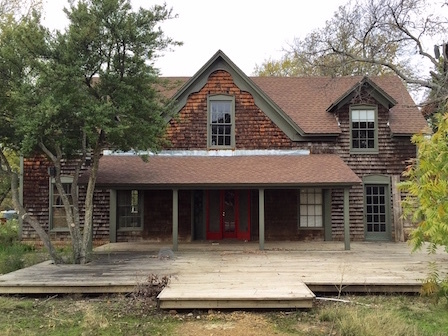 The restoration of the Collinwood House on its original site within a public park can serve to educate future generations of Plano about the community’s 19th century origins. Programs related to architecture, sustainability, history and agriculture would complement a plan for community events. A public-private partnership, modeled on other similar partnerships in Texas, can bring needed charitable contributions to make the project a success. UPDATE: Threatened with demolition to make way for a new park pavilion, the Plano City Council voted in April to delay demolition of the Collinwood House until August to allow proponents to raise $1.5 million to save it.